This year we're looking at a few different stories from the bible of people encountering Jesus and having their lives turned upside down. We're blessed to have our new Senior Pastor come on camp and tell us these stories and spend the weekend getting to know this next generation of young people. 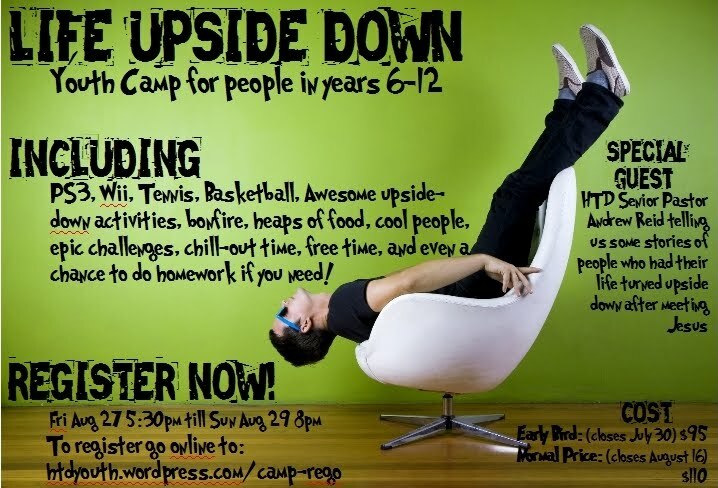 Life Upside Down is theme for our camp and over the next couple of months the Youth Leadership Team and I are going to be working hard coming up with some creative upside down games! We're praying and believing for at least 30 youth on camp this year. Dates are August 27-29th. I'd love you to join us in praying for a successful camp this August!